In a zombie apocalypse, the Birkenstocks stay behind. Of course, after that, we proceed to have an hour long conversation how how exactly we would survive the zombie apocalypse and if we’d have it in ourselves to do the needful if needed (ie, kill the other person if they ever got infected). 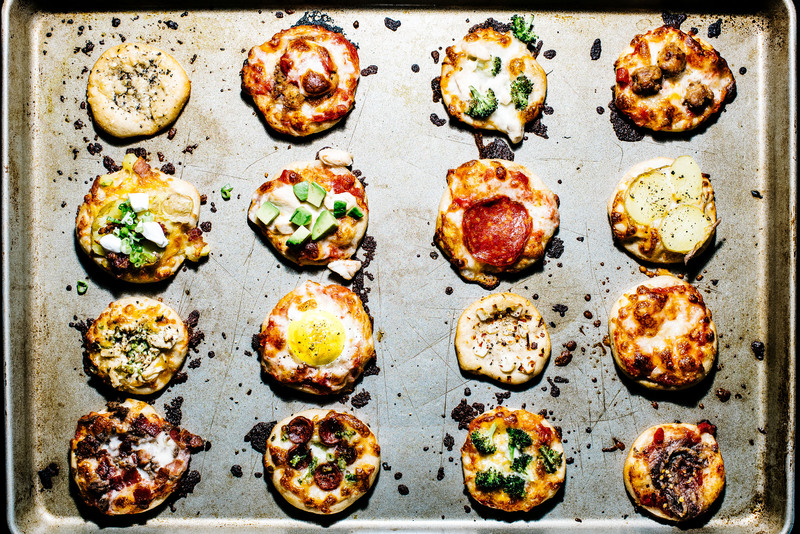 Eventually, we looped back to pizza toppings and the next day I almost died of cuteness while shaping these tiny pizza crusts. It was beyond a doubt fun making the pizzas but it was also hilariously fun rating them. We both agreed that the baked potato pizza – baby baked potato, bacon, sour cream, chives – was the clear winner. 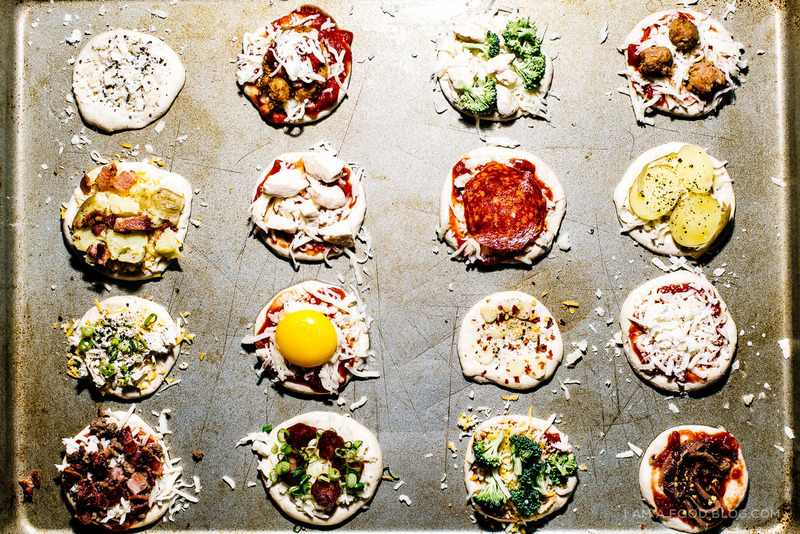 I hope you guys get a chance to make some mini pizzas. 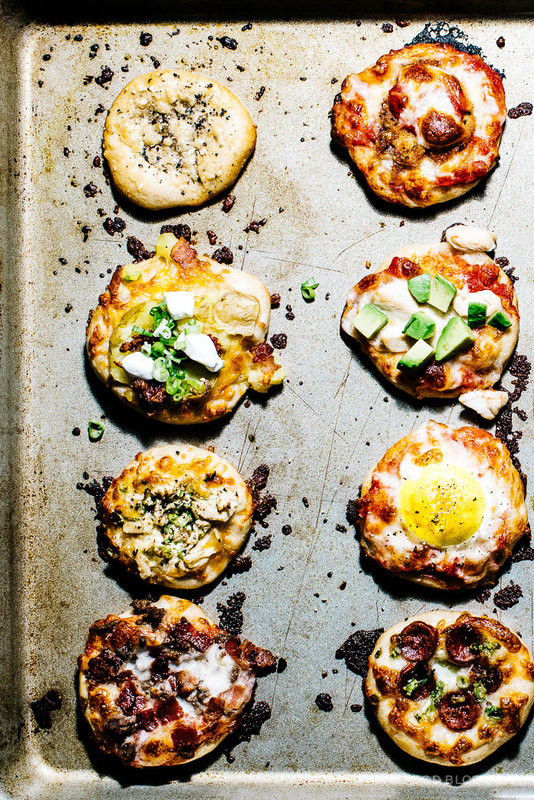 Or if not mini pizzas, a giant pizza with all your favorite toppings. Now that weather is turning just a bit cooler, I hope ovens everywhere are getting the love they deserve and getting stuffed with pizza, both big and small! Whisk flour, salt, and yeast in a medium bowl. While stirring with a wooden spoon, gradually add 3/4 cups water; stir until well incorporated. Mix dough gently with your hands to bring it together and form into a rough ball. Transfer to a large clean bowl. Cover with plastic wrap and let dough rise at room temperature in a draft-free area until surface is covered with tiny bubbles and dough has more than doubled in size, about 18 hours. Transfer dough to a floured work surface. Gently shape into a rough rectangle. Divide into 16 equal portions – they will be quite tiny. Working with 1 portion at a time, gather 4 corners to center to create 4 folds. Turn seam side down and mold gently into a ball. Dust dough with flour; set aside on work surface or a floured baking sheet. Repeat with remaining portions. During the last hour of dough’s resting, prepare oven: arrange a rack in middle of oven and preheat to its hottest setting, 500°–550°. Working with 1 dough ball at a time, dust dough with flour and place on a lightly floured work surface. Gently shape dough into a small 3″ disks. 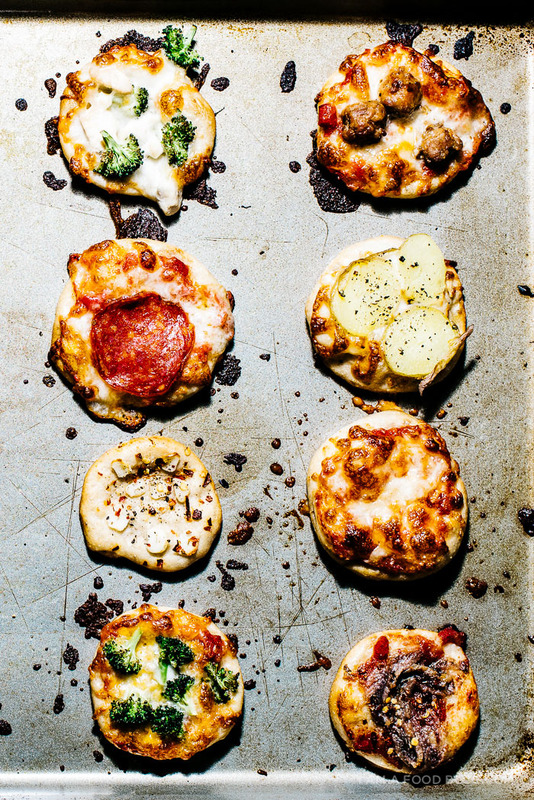 Arrange dough disks on a lightly oiled baking sheet; top with desired toppings. 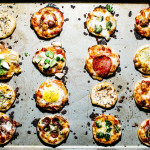 Bake pizzas until bottoms of crusts are crisp and tops are blistered, about 8-10 minutes. Transfer to a work surface to slice, if desired. it’s like pizza dim sum (because of all the variety and the tiny things that fill you up more than you’d think they would)!! never worn birkenstocks so i can’t personally vouch, but i feel like they’d be a treasured commodity in an apocalypse; if you’re going down, might as well be wearing comfy shoes. Humble Pie and Pizzeria Bianco both offered pizzas topped with red onion, pistachio and parmesan (and leek at Humble Pie). I highly recommend this combo, it was unexpectedly amazing, and one of those things that people either loved or hated. I love this! 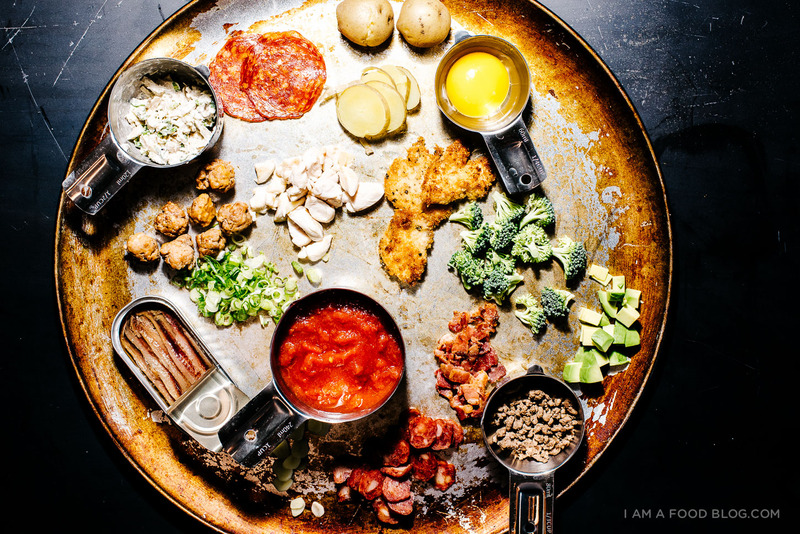 Your photos are outstanding and the presentation has me running to the kitchen to get started. I tend to make muffins this way (loading each muffin with something different before baking) but this idea is brilliant. Major high fives and heart eyes emoji. Any recommendations regarding freezing the dough for use another time? i haven’t frozen the dough, but i know that other people have with great success. BEST. THING. EVER. Mini pizzas!!!!!!! I want them all!! You are soothing my indecisive soul right now with these beauties. (ALSO, chinese sausage, green onions and mozzarella is killin’ me right now. YES. So much yes.) PS I’m so glad that B2 and I aren’t the only ones that discuss zombie apocalypse plans. So far we’re at (a) get out of Manhattan and (b) jk we’d prob both die or get infected right away. This is pretty much the best thing I’ve seen all day. i love this idea!!! wow i miss pizza. like so much. i wonder if i could do this same thing with a gf crust (somehow?). anyhow this is great! I’m just dying over here. So cute! You are a genius! My housemates and I were just talking about having a pizza party today – your timing is just as perfect as the post Steph! And the mini-ness = no more sad days of topping overload/soggy crust!! I want all these minis and I want them all to myself. Also, that GIF! OH and one last thing, “In a zombie apocalypse, the Birkenstocks stay behind.” I was LOL’ing hard on that one. I’m definitely going to try this at a dinner party soon. Your recipe is clear, concise and easy to follow. My kids loved making these and the choices are endless! Looks so YUMMY IN MY TUMMY THANKS FOR SHARING THIS GREATLY APPRECIATED SOUNDS AWESOME THANKS. How did you get the egg to stay put on the egg/tomato/mozzarella one? If I can’t immediately work with the dough at the 18 hour mark, is it OK to refrigerate it for a day or so until I need it?